Use exit intent to grow your email list and online store. Show a special offer to visitors leaving your site before it's too late using Privy's exit intent technology. The best way to acquire new customers is through the high intent traffic coming to your website. Privy's exit intent system tracks a user's movements on a page and prompts an event (like a popup, flyout, or spin to win) when it detects a visitor is about to leave the site so you can reach them before they disappear. Read more about triggers and targeting. 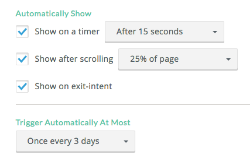 With our exit intent banners and popups you can present offers or signup forms to visitors who are about to leave your site, whether they are on a desktop computer or their mobile device. The facts don't lie. Using an offer-driven signup can double conversions rates. Go into your dashboard and create a campaign (or select an existing one). In the design step, open the display trigger card. Save visitors and grow your list!